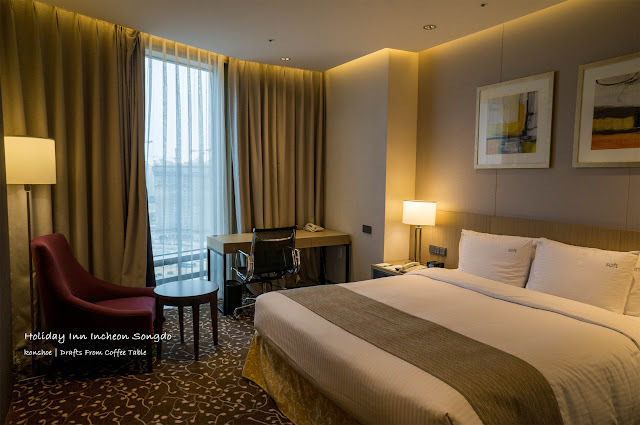 Note: This article was written base on experience of staying in Holiday Inn Incheon Songdo's King Bed Superior Room. The following info is important to you because it tells you on which month we stayed, and the price relative to the amount of time between the date of stay to the date of booking. You may experience higher or lower price at different months/seasons and if you book further or nearer to the date of stay. Incheon is a familiar name for frequent travelers to South Korea since this is the name for its international airport, which is named after the region where it is located. Unknown to most traveler though is that Incheon is a large region whereas the airport only lies on a strip of artificially island in said region. My recent business brought me to the industrial areas of Incheon, an area that is right across the airport and Holiday Inn Incheon Songdo was located at just the right distance for my convenience.